Please know that we stand 100% behind our Guarantee. 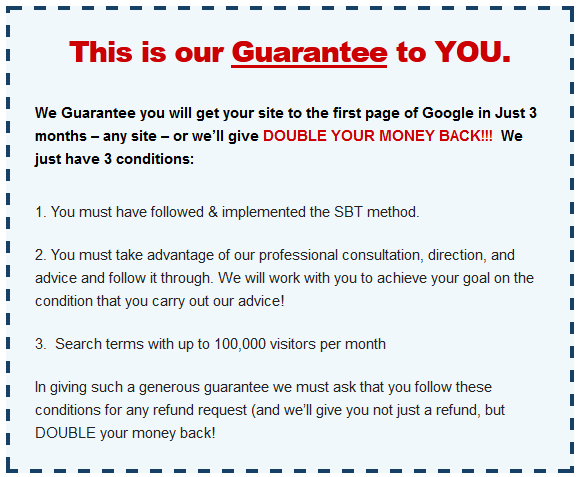 We will give you, not just your money back, but double your money back! Please note that as it says, “in giving such a generous guarantee we must ask that you follow these conditions for any refund request.” We do indeed ask that. There is no refund offered outside these terms. The reason is that the information in this training course is so insanely valuable – this course gives you the ability to rank at will in the post Penguin/Panda world. Very few people have that knowledge. We cannot possibly offer an unconditional refund on this sort of information and training. Once it is accessed, it is accessed. Occasionally, people will say “well I’m not going to use the information” or “I haven’t really looked” but we have no way of verifying this and, once purchased, the terms of the contract of sale have been fulfilled. In the same way that we would never seek to change the contract of sale between us after the event (eg by saying ‘well actually we’re not going to give you access to the Facebook Group‘ or ‘we’re not going to give you any support unless you pay’) in the same way we ask that you respect the terms of the guarantee and refund policy which is part of the contract of sale. Please respect and follow these terms, just like everybody else does. Rather than spend time on refunds we’d prefer to work with you to achieve your goals, which we will do. Please get back to us so that we can help you with whatever challenges you are facing. Our teaching works! Let us help you make this year the year you break free! We WILL work with you and deal with any dissatisfaction you might have! After trying out the SBT system, I found out that not only where my sites not ranking, but my rankings actually decreased. Slightly disappointed, I sent out an email to the support asking for a full refund. After asking for a refund, I was told to wait a bit longer since I've done everything right. Well guest what. I'M ACTUALLY RANKING!!!! This is with a keyword that has a traffic of 40,000 visitors a month! It seems that I wasn't being patient enough, my site went from ranking nothing all the way close to the second page. Before purchasing the SBT system, I was very skeptical to whether or not it'll work. After spending tons of money on online courses, buying link packages and wasting a lot of time on forums trying to rank my sites, I found that nothing was really working. I honestly can't believe it worked. Not only that, but another one of my keyword that has a traffic of 18,000 visitors a month is now ranking on the first page of Google! Honestly, this system is a no brainer. There's a lot of misinformation out there, most of which I've tried but nothing that has been as effective as the SBT system. I'm pretty difficult to please, but after trying out this system, I'd be more than happy to recommend this to anyone looking to rank on Google. Especially for those that have no SEO experience at all. Occasionally, our customers have decided to issue a PayPal dispute, thinking this an easy way to force our hand to refund the money. Sadly, this does not work. PayPal’s buyer protection policy does not extend to intangible products, and they will NOT award the dispute in the buyer’s favor in the case of SEO Breakthrough. Please see this screenshot below of a recent dispute resolution from my (the seller’s) PayPal account. However please note that if you do choose to file a PayPal dispute, we will consider you in breach of contract and will remove all our obligations towards you, including our offer of help and support, access to our site and the Sniper network. Nothing is gained for either of us in filing a dispute. Let us help you and work with you. Nothing is solved by confrontation. Everything is solved with support. We will help you. We will not, however change the terms of our Guarantee and Refund policy after the sale. Please let us know how we can help you achieve your goals!